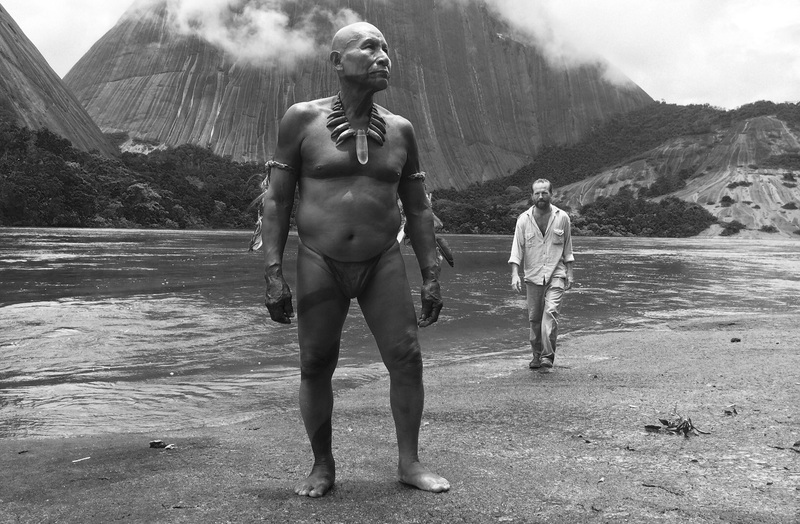 “Embrace of the Serpent” (“El abrazo de la serpiente”) (2015). Cast: Nilbio Torres, Jan Bijvoet, Antonio Bolívar Salvador, Brionne Davis, Yauenkü Miguee, Luigi Sciamanna, Nicolás Concino. Director: Ciro Guerra. Screenplay: Ciro Guerra and Jacques Toulemonde. Source Material: The diaries of Theodor Koch-Grünberg and Richard Evan Schultes. Web site. Trailer. What happens when individuals from two very different worlds come into contact with one another? In some instances, such clashes of cultures can have devastating effects. But, in other cases, the interaction can lead to entirely new understandings of one another, especially for those whose eyes have been closed to revelatory insights and blinded by superficial and materialistic concerns. Such is the experience of two Western explorers who journey into the remote Amazonian rainforest in the stunningly beautiful new Colombian epic, “Embrace of the Serpent” (“El abrazo de la serpiente”). 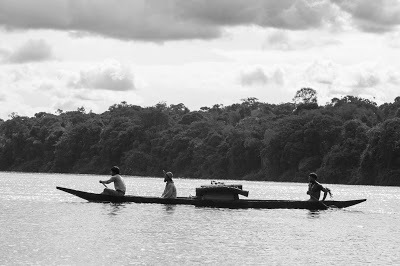 European explorer Theo (Jan Bijvoet, center), accompanied by his caboclo, Manduca (Yauenkü Miguee, left), and shamanic guide, Karamakate (Nilbio Torres, right), travel up river in the Amazon rainforest in search of the mysterious yakruna plant – and an uncertain future – in the Oscar-nominated feature, “Embrace of the Serpent.” Photo courtesy of Oscilloscope Laboratories. In the course of Theo’s journey, set shortly after the turn of the 20th Century, the European explorer becomes seriously ill during his travels and seeks out the legendary yakruna plant as a possible cure. Accompanied by Manduca (Yauenkü Miguee), his caboclo (an acculturated native who works for Westerners and is often viewed disparagingly by his peers), Theo searches for someone familiar with the plant and its possible whereabouts. They soon meet Karamakate, who knows how to find the mysterious botanical. But the shaman is reluctant to offer help, given that he is the last of his people, his tribe having been massacred by white rubber barons who plundered the Colombian jungle in their quest for this valuable commodity. In the end, however, Karamakate sets his anger aside and relents, agreeing to lead his traveling companions up river in search of Theo’s hoped-for salvation. Fast forward four decades to a time when Evan retraces Theo’s footsteps based on his predecessor’s published diaries. Though he’s not ill, the American adventurer also seeks yakruna, as well as someone who can help him find it. He meets an aged Karamakate, whose memory has failed him considerably. He believes he has become a chullachaqui, a mythological figure of the Amazon who takes human form but is empty on the inside and roams the jungle waiting to find someone to deceive. Karamakate agrees to help Evan in his search, though he’s not sure how to find the plant – or even why he’s doing so – because his memory has faded not only when it comes to his familiarity with his surroundings, but also for his very mission in life. With these twin story lines set up, the film then follows the adventures of each expedition, intertwining the experiences of each explorer and the younger and elder Karamakate and showing the parallels between their respective journeys. Both narratives illustrate the characters’ interaction with the region’s indigenous people, the environment and outsiders who have descended upon the rainforest. In particular, the parallel story lines pay special attention to the impact of Western religion on the natives, first through the dogmatic teachings and brutal conversion practices of a missionary priest (Luigi Sciamanna) and later through the cultish ravings of maniacal self-proclaimed messiah (Nicolás Concino) who grew up under his evangelizing predecessor’s tutelage. Through their respective experiences, Theo, Evan and Karamakate come to a variety of revelations about themselves. And what began as journeys with specific purposes gradually morph into odysseys far different from what was expected, changing everyone concerned in ways they probably never could have imagined. 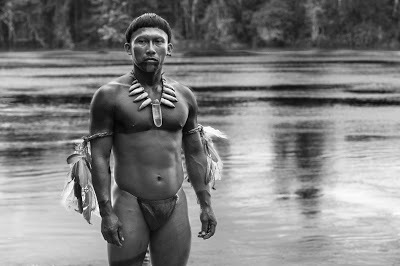 In his younger days, Amazonian shaman Karamakate (Nilbio Torres) leads a Western explorer into the heart of the Colombian rainforest – and a journey of self-discovery – in the Oscar-nominated epic, “Embrace of the Serpent.” Photo courtesy of Oscilloscope Laboratories. “Embrace of the Serpent” is rich in themes related to the principles of conscious creation, the philosophy that maintains we manifest the reality we experience through our thoughts, beliefs and intents. 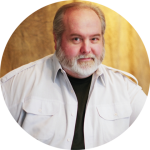 For nearly everyone concerned, these journeys shed light on the nature of their respective underlying thoughts, beliefs and intents, notions that have eluded them for the most part. Their experiences help to enlighten them of their purpose for being not only in the Amazon, but also in the world at large, by showing them what their true beliefs are, not the superficial, ego-driven considerations that seem to preoccupy the bulk of their attention. The foregoing is certainly true for the Westerners, but it’s especially relevant for the elder Karamakate, who must come to rediscover his reason for being (something many metaphysicians contend is true for all of us who have chosen to incarnate in physical existence). As a shaman who has somehow lost his way, the elder Karamakate must find his way back, to once again recognize, embrace and embody his purpose in life. This is a lesson many of us today should take to heart. Adopting such an outlook is crucial for understanding how we fit into the greater scheme of things, to realize that we’re all connected to one another and to everything. This has ramifications on many levels. For instance, in purely physical terms, it illuminates our connection to our tangible surroundings, most notably the earthly environment of which we’re a part. Campaigns aimed at drawing attention to the plight of the Amazon rainforest in recent years have become the poster children for environmental causes, highlighting the integral connection between it and all of us – and how we had pay better heed to it. The film makes the essential nature of this bond obvious, showing not only its importance, but also how an appreciation for it is a form of ancient wisdom that we must all rediscover before it’s too late. Karamakate serves as a sentinel of this knowledge, reminding his companions – and, by extension, us – of its relevance to our well-being, if not our very survival. But the sense of connection explored here goes beyond just physical considerations. Karamakate’s reawakening experiences ultimately show us how we’re also linked to a greater existence of which we and our corporeal reality are a mere part. This larger sense of being transcends the tangible, taking into account the greater whole in which we dwell, one that includes the intangible portions of our selves, parts that we may not understand or recognize but that are nevertheless just as integral to us as those with which we’re more familiar. 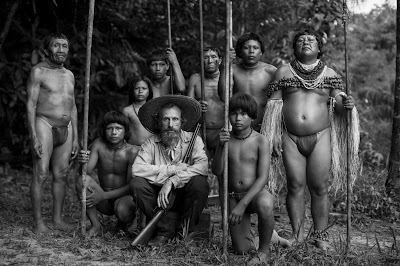 European explorer Theo (Jan Bijvoet, center) interacts with the indigenous people of the Amazon in director Ciro Guerra’s latest release, “Embrace of the Serpent.” Photo courtesy of Oscilloscope Laboratories. With such an expanded awareness, we’re likely to take a different view of things. For example, in light of this, we may well treat our world far differently, putting forth beliefs about its maintenance and ongoing creation that are much more considerate than what we employ presently. This is illustrated through the intents of the Westerners in the film, who frequently put short-term considerations before the bigger picture, a cautionary tale we can all learn from. But this applies on a larger scale, too. When we realize that we’re more than just our physical trappings, that we’re part of a larger, interconnected intangible whole, we may well take a very different view of the reality we create – and not just in purely physical terms. This makes possible a whole range of probabilities never before considered. By embracing this broader view, it’s possible to set aside potentially unproductive manifestation practices, such as the process of un-conscious creation, the approach to this philosophy where we let existence unfold by default, without due consideration for what we put into it. When we concern ourselves with the consequences of our actions and take responsibility for what we materialize, the thought of letting our existence manifest seemingly at random suddenly seems anathema to us. This expanded view also gives us a new appreciation for the range of probabilities for existence available at any given time, and the film symbolically represents this concept beautifully. For example, as Karamakate and the explorers travel up river, they follow a set course, one that’s symbolic of a single line of probability. However, the river flows through the darkness of the jungle, symbolic of a defined path cutting its way through the intangible realm of limitless though unexpressed probabilities. And, as the travelers wend their way further into this dominion of possibilities, they learn there is more to existence than the here-and-now with which they’re most familiar, enabling them to push limits aside, broaden their mindsets and envision options that they hadn’t previously considered.  This gives them – and us – a broader appreciation for what’s possible, defying whatever limitations we’ve imposed on ourselves or allowed ourselves to embrace, dividends with payoffs that are potentially substantial – for all of us. Years after his first journey up river, an elder Karamakate (Antonio Bolívar Salvador, foreground) leads American explorer Evan (Brionne Davis, background) on a second expedition in search of the mysterious yakruna plant in “Embrace of the Serpent.” Photo courtesy of Oscilloscope Laboratories. Despite some occasional pacing issues and a periodically under-explained back story, “Embrace of the Serpent” is a gorgeously filmed release that explores a variety of issues, from reverence for the environment to respect for other belief systems to understanding the true nature of our place in the Universe. With narrative and cinematic elements reminiscent of “The Mission” (1986), “Apocalypse Now” (1979) and even “2001: A Space Odyssey” (1968), this unique production offers viewers an intriguing array of images and ideas, all framed within a backdrop of stunning black-and-white cinematography. It’s easy to see how this picture deservedly became one of 2015’s Oscar nominations for best foreign language film and an award winner at the Cannes Film Festival. It also won the Sundance Film Festival’s Alfred P. Sloan Feature Film Prize for movies that promote cross-cultural understanding. While this may not be everyone’s cup of tea, the film is definitely something worthwhile for those who appreciate decidedly different viewing options. It’s currently playing in theaters specializing in foreign and independent cinema. Considering how easy it is to become preoccupied with the minutiae immediately before us, it’s often helpful to be reminded of the greater scheme of things and how we figure into it. 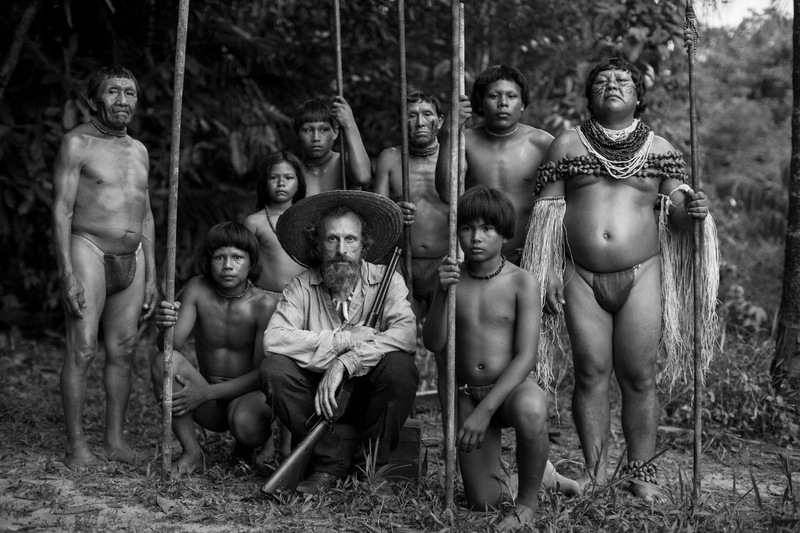 “Embrace of the Serpent” does just that, prompting us to take a wider view – and what it all means.